When your elder loved one is diagnosed with Alzheimer’s disease, you might not expect some of the areas in which she develops difficulties. One such surprising situation for many caregivers is that suddenly getting dressed can be extremely difficult for your loved one. This is the case for anyone, actually, but it’s especially true for your elder loved one if she has Alzheimer’s disease. The reason that clothing is so overwhelming is that there are so many choices and so many different combinations that your loved one can face. This can be paralyzing, so you need a system for managing all of the clothing and even getting dressed. Your loved one can likely do a lot more than you believe, especially if you actively find ways to help enable her in this endeavor. Give your loved one a choice only between two pieces of clothing or outfits. Offering more choices ups the overwhelming aspect even more. One other way to help limit choices is to take a seasonal approach to your loved one’s wardrobe. 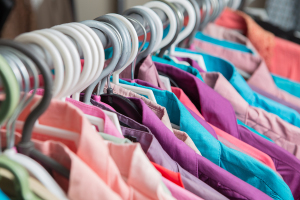 Every quarter, take a look at your loved one’s clothing and remove what doesn’t really fit that season. Store it away and bring out the clothing that does match the current season. This way you’re not dealing with your loved one’s entire wardrobe, you’re only dealing with a portion of it. When decision-making becomes much more difficult for your loved one, try keeping full outfits together on the same hanger. This eliminates a lot of the decision-making process and enables you and your loved one to help her get dressed much more quickly. Having a system keeps both you and your loved one more organized about her clothing. Your system might involve laying out your loved one’s clothing the night before in the exact order she needs to put everything on. If there are other people helping your loved one get dressed, such as elder care providers, make sure they know the system, too. Once you and your elder loved one develop a method of managing her wardrobe that works well for her, put it in practice and modify it as needed. For Elder Care Services in Codova TN, please contact the caring staff at Personal Care Services MidSouth today! This entry was posted in Alzheimer's Disease/Dementia, Elder Care Cordova TN and tagged Elder Care Cordova TN. Bookmark the permalink.